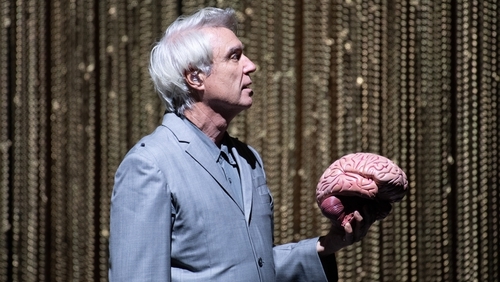 David Byrne: "the most interesting man in pop"
The artist's fascinating journey from Talking Heads to new album "American Utopia"
David Byrne has spent four decades being "the opposite to his peers", as Arena’s Sean Rocks put it. Whether with Talking Heads or his more recent theatrical endeavours, he’s managed to carve out a place for himself at the table of pop. RTÉ journalist Jim Carroll has seen Byrne’s latest tour, "American Utopia" (which arrives at Dublin's 3Arena on October 24th) and he talked about how Byrne has created one of the most anticipated concert experiences of the year. It’s fair to say Byrne is no stranger to Ireland. Carroll remembers going to his first post-Talking Heads Irish tour all the way back in 1989 at Dublin's then named Point Depot. He hasn’t lost the magic with ‘American Utopia’, Carroll says. "It’s quite fascinating. But, like, what would you expect from the man? I mean, this is the whole thing about David Byrne. The case can be made, the NME can make it as well, I’ll make it, David Byrne is probably the most interesting man in pop, still." Born in Scotland, Byrne grew up in Maryland, where he dropped out of a few schools. Then along came Chris Frantz and Talking Heads. Meeting Brian Eno in London in the mid-70s added another element to the group. "Him and David Byrne quickly discovered they were soul brothers." Eno would produce the next few releases for the band. "He brought the shimmer and he brought the funk…Eno has remained part of David Byrne’s kitchen cabinet all the way since." Meeting Eno allowed Bryne to "flourish", Carroll says, and has led to some of his experimentations, like attempting to use buildings as instruments. "They released a collaborative album together in the 70s called "My Life in the Bush of Ghosts". It’s an album which basically brought samples, found sounds and rampant experimentation to the fore. In many ways, Byrne took that and he ran with it. He’s ran with it for all his career." It’s testament to the band that the tracks are still so widely played, Carroll says, estimating that you’re "never more than 20 minutes away" from a Talking Heads' song being played at a bar or club. "The tracks are still current. The tracks still have a currency. And that’s an incredible thing for a band that was in its heyday 40 years ago." Carroll praised the "theatrical prowess" that went into the Stop Making Sense film when the 4-piece became a 9 and 11-piece for the 1984 concert film. "Many people will see the film and go, ‘Ah yeah, the lad in the big suit’. But besides the ‘lad in the big suit’, you’ve got a band playing at the peak of their powers."